Mood: Let's try this running thing again! I have been avoiding running due to a nagging heel pain. I wouldn't exactly say it's an injury, but it's irritating enough to have me on my bike most mornings that I exercise. The previous night, I did a little Googling and found a potential diagnosis of Heel Pad Syndrome. I have no idea if this is what I'm dealing with, but it sounded like it, and one of the recommended treatments is to tape up my heel to bolster the padding on my heel. I did that on this morning, and it made me feel instantly much better. Not perfect, but definitely good enough to run. I hadn't exercised since a bike ride on Christmas Eve, and I was desperate to get back out at it. Due to snow, my bike was out of the question, but I figured with the tape job, I could at the very least get out and do a short run. 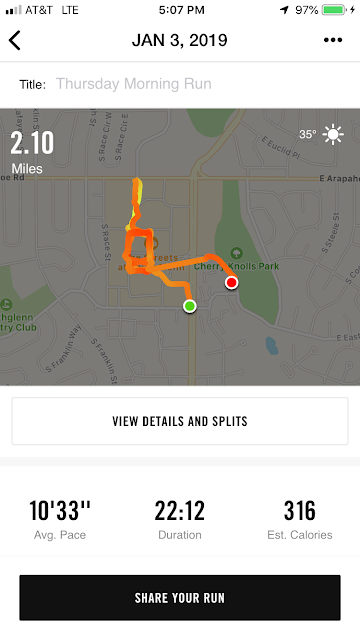 It felt good to be running again, although my conditioning has fallen apart. I was quickly huffing and puffing, and it felt like the initial few months when I started running way back in 2012. I was slow and had to take several breaks, and only ended up notching slightly over 2 miles, but it felt good and I was able to run, even if just a little, and that was a victory.